(Image Credit: The Bridgeman Art Library) Painting. Jerusalem from Job’s wall. 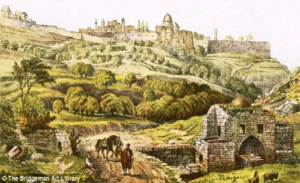 Why is agriculture important to the culture of the Jews and Jerusalem? The answer has a long history. Even before David conquered the City of Jerusalem, agriculture played an important role, not only for those engaged in farming, but also for every descendent of Abraham. The far reaching nature of crops is something many of us today take for granted with access to supermarkets and grocery stores, where virtually every food we could want can be found, yet, it wasn’t long ago that this luxury didn’t exist. Before Israel was a nation, the sons of Abraham, Isaac, and Jacob worked the land. Even the sons of Jacob, who would become the twelve tribes of Israel, worked the land of their father, growing grain crops and harvesting the land, in addition to shepherding their father’s flocks. Yet, as Solomon wrote in Ecclesiastes 3:1, “To everything there is a season,” and the people of Jerusalem and Israel knew this. 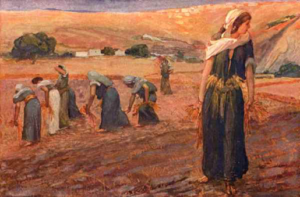 There were times and seasons to bring offerings to the Lord, and times and seasons to prepare, sow, and harvest crops. Some twenty miles west-northwest of Jerusalem, in the town of Gezer, a calendar was found from the tenth century BC (see image below). The calendar tells of the planting, harvesting, and pruning cycles of not only the seven species—wheat, barley, pomegranates, figs, dates, olives, and grapes—but likely of all the crops the ancient Jews would have grown. It gives the seasons for God’s people. Two Months of Late Sowing Jan. through Feb. Through the Gezer calendar we see not only times for those engaged in agriculture, but for those selling and buying, and more importantly, for those keeping the commands of the Lord—such as the giving of firstfruits. Still, the Gezer calendar does not mention the Sabbath year, as it is something no ancient Jew could have easily forgotten. They would till, sow, and reap, prune and gather fruit from the vine and branch, for six years. Then, on the seventh, they would refrain from such, allowing their fields and groves to regain necessary nutrients, while remembering that the God of all took the first Sabbath. For those who didn’t farm the land, they still knew the seasons and honored God’s gifts of the earth throughout their lives. This can be seen both through the Word, and through the archaeological record. 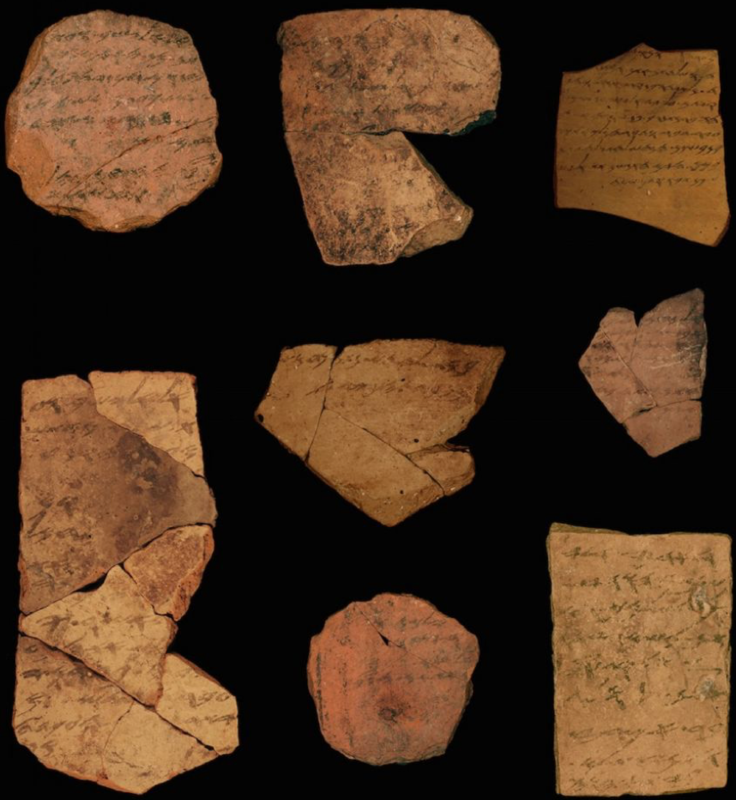 One common example can be found written on ostraca─inscribed potshards─which allow us to see everyday uses of certain agricultural products (see images below). The most commonly mentioned products were olive oil and wine, but we also see mention of flour from grains such as wheat and barley. And, it wasn’t only the farmers and even royal gardens and plots sending out their products, but traders, priests, and even military personnel who owned, transferred, or requested these items. 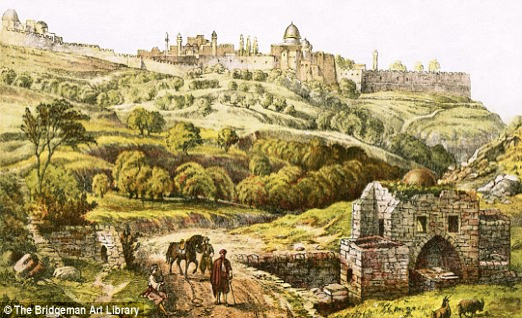 The Tel Arad fortress, which would have protected the land of Judah and Jerusalem from whatever military threats that may have risen, includes many ostraca. 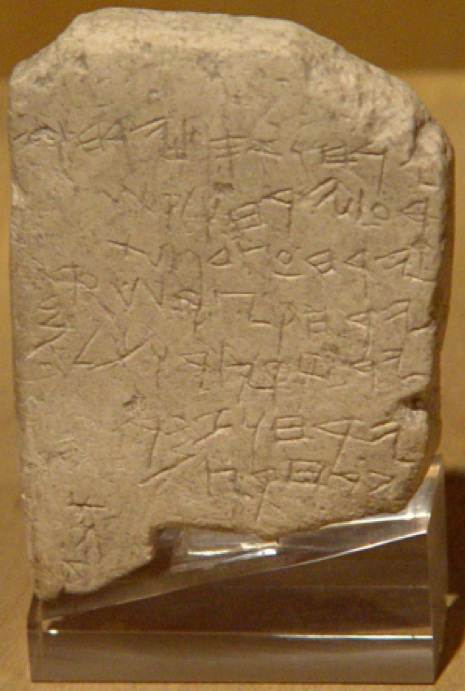 One ostraca from Tel Arad reads, “To Eliashib: And now, give the Kittiym three baths of wine, and write the name of the day. And from the rest of the first flour, send one homer in order to make bread for them. Give them the wine from the aganoth vessels.” This inscription shows us not only an everyday use, but also a vital one for the protection of the land and people. 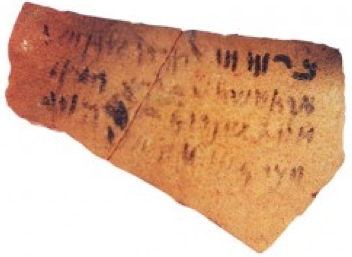 (Image Credit: https://www.biblicalarchaeology.org/daily/ancient-cultures/daily-life-and-practice/ancient-aramaic-business-records/) Ostraca recording the delivery of barley and wheat. 4th century BC. 40 miles southwest of Jerusalem. Right: (Image Credit: the Institute of Archaeology, Tel Aviv University, and the Israel Antiquities Authority) Ostraca from Tel Arad Fortress. Estimated 7th century BC. 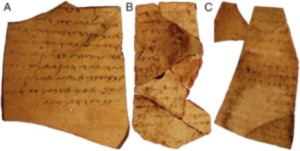 (Image Credit: Tel Aviv University/Michael Kordonsky, Israel Antiquities Authority) Inscriptions on ostraca in ancient Hebrew dating back 2,500 years, discovered near Arad. Other examples of everyday uses and depictions of agricultural products—specifically of the seven species found in the King’s Valley of Jerusalem—include bulla or seals, and coins (see images below). Yet, religious uses were most certainly found daily, be they in the form of ornamentation, oil for lamps or anointing, or even sacrifices and offerings. 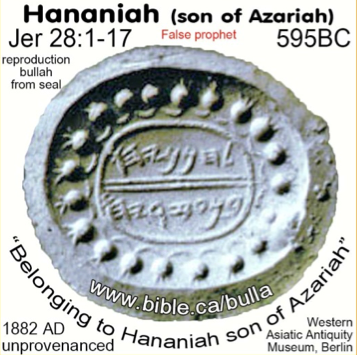 (Image Credit: bible.ca/bulla) Bulla aka seal reading: ‘lhnnyhw bn’zryhw’ or ‘(belonging) to Hananiah, son (of) Azariah.’ Found in Jerusalem. Pos. referencing the false prophet in Jer. 28:1-7. (Image Credit: http://lila.sns.it/mnamon/index.php?page=Esempi&id=8&lang=en) Bar-Kokhba revolt, second year of the revolt, 67-68 AD. Inscription reading: ‘Half Shekel Year Two; Holy Jerusalem.’ The coin features a chalice, likely from the Temple on one side, and three pomegranates on the reverse. The Temple in Jerusalem was replete with agricultural species depictions. Pomegranates were carved in ivory, bronze, and gold for priestly articles, and King Solomon for the Temple had “made one hundred pomegranates, and put them on the wreaths of chainwork” (2 Chronicles 3:16). Date palms, lilies, and various other plants would grace religious implements, vessels, and pillars. While, even the two massive cherubim within the temple were made of olivewood. Indeed, by this alone we can see the importance of God’s gifts of the earth within the very heart of the culture─their relationship with God. Yet, it does not stop there. For the feasts, for sacrificial offerings, burnt offerings… in all of these we again see the significance of agriculture in the culture. At the Temple in Jerusalem, the people of Judah would bring their ‘gifts’ to God. Offerings of firstfruits such as wheat and barley, would be waved before the Lord by the Temple priests (Leviticus 23:9-14). Additionally the oil to light the lamps of the Temple and the holy anointing oil, were made of the purest olive oil. 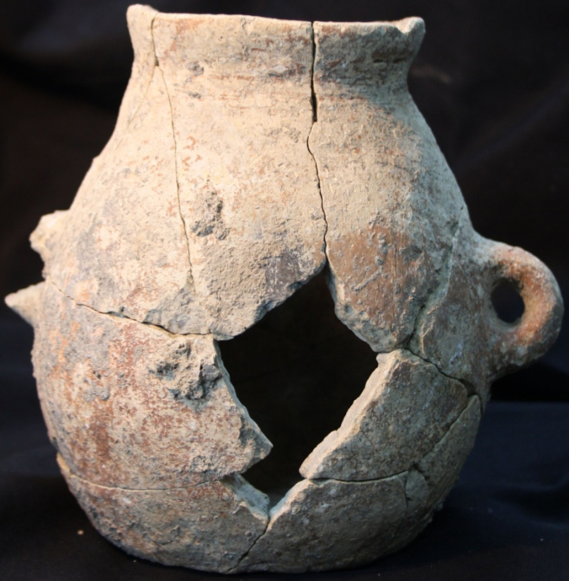 (Image Credit: http://www.haaretz.com/jewish/archaeology/.premium-1.632310; Photo By: Israel Antiquities Authority) 8,000 year old clay vessel containing traces of olive oil. Vessel found at Ein Zippori. Through the act of farming the land, of trading, of using the crops to feed the military protecting Judah and Jerusalem, of the everyday reminders, of the very Temple of the Lord… again and again the agriculture of Judah creates a beautiful pattern. God’s gifts of the earth showed the people His love, and they in-turn not only cherished it in their daily lives, but also returned a portion of God’s gifts as an offering, as a pleasing fragrance, causing an outpouring of God’s love within their hearts. Yes, God’s gifts of the earth were poured out upon His people, and this act of loving-kindness affected their lives, their actions, and their culture. Therefore, even before Israel and Jerusalem existed, even before God called Jacob, Israel, Jacob acknowledged God’s holiness on earth by using God’s gifts. Twice, Jacob set a stone upright and poured oil upon it, as an acknowledgment of holiness—that the place was a ‘Temple,’ a ladder to God (Genesis 28:12). Jacob used God’s gifts to remember Him and His power; as did the generations to follow. Today, we are once again remembering God’s gifts of the earth and His Word. My Olive Tree is—through your support—replanting the seven species in the King’s Valley, as in the days of the first King’s of Jerusalem. We are also planting olive groves and vineyards throughout Israel, within the deserts of the land, thereby making the desert bloom. And we are replicating the holy anointing oil described in Exodus 30; fulfilling through all of these, God’s Word, and remembering His loving-kindness and tender mercies.